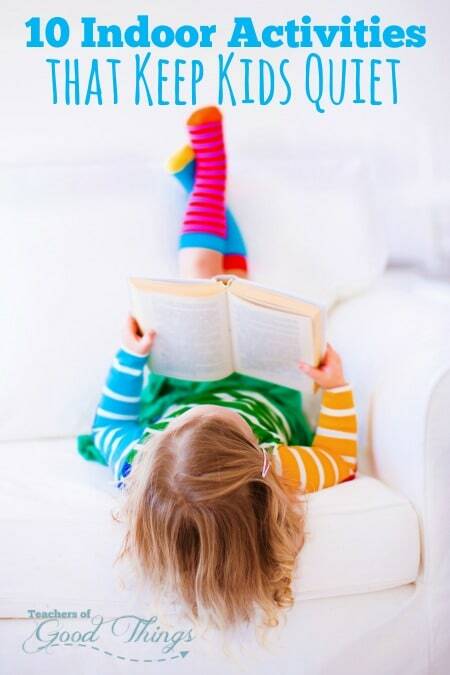 Are your kids bouncing off the walls, or acting bored? These indoor activities will give them the opportunity to get some of bound up energy out, and get them ready for a good night's sleep even if the weather won't them get outside. Cooler weather is already here and in fact, we have already had some really cold days. My little guy needs some ways to burn off his full energy self every day, so I decided to list ten things he can do INSIDE to get that energy burned. Indoor Trampoline – My son has loved his indoor trampoline as much as the outdoor one, but we only have it come out during really hot weather or cold weather. This Fold & Go Trampoline is a perfect way for kids to get some energy out while stuck inside. Mattress Jumping – So many parents do not allow the children to jump on the bed, but why not? Every time we have guest visit from out of town, we pull down a double mattress from the attic and the first thing my kids want to do is jump on it. My son knows how to remove his twin size mattress to use as a climbing obstacle and jumping fun. Yes, it makes the room mess and takes a few more minutes to put him in bed at night, but he is tired enough to go to sleep and that is important to us. Build a Tent – Getting the mind and body engaged is a great way to getting your kids active and moving together. Building a tent is something that can last for hours with the right size blankets and creativity. Move furniture around to allow for a room size tent for long lasting fun and then have them put it back together when they are done. Moving Electronics – Video games have come a long way! I remember when I changed my mind about having one in our home because of the level of the body getting in motion and having it be a family game. We enjoy the Wii or XBox 360 to bring our bodies in motion, while laughing and exercising together. Dancing – Children LOVE to move their bodies, so why not use dance to get their energy out. Not everyone agrees on the same dance, but I'm sure the library will have a variety of DVDs to learn different ones. I love line dancing and so does my husband and daughter, but with the love of everything Disney, I know that many kids love the Just Dance for the Wii. I can't personally give my opinion because I have never seen it, but I know some families that use it and have mentioned it to me. Exercise – Mommy's love of Walk at Home and they even have a FAMILY WALK that you can do together. There are different kids exercising DVDs, so maybe let them choose the one that looks fun to them! And of course, they enjoy doing a treadmill, stationary bike, elliptical or other exercise machines. Of course, just the old fashion stairs, sit ups, push ups and such can do the trick, too! Active Board Games – The first game that comes to mind that can work out the body is Twister! Getting the kids moving with Charades. Indoor Obstacle Course – I remember times when my children would rearrange things to turn them into obstacles and run through things. Yes, up to a certain age, we allow our children to run in the house if the weather doesn't allow them to get outside. With the use of painter's tape, you can create an obstacle course up and down the hallway that will get your children feeling like spies working to avoid the laser beams, as the navigate from one side to the other. 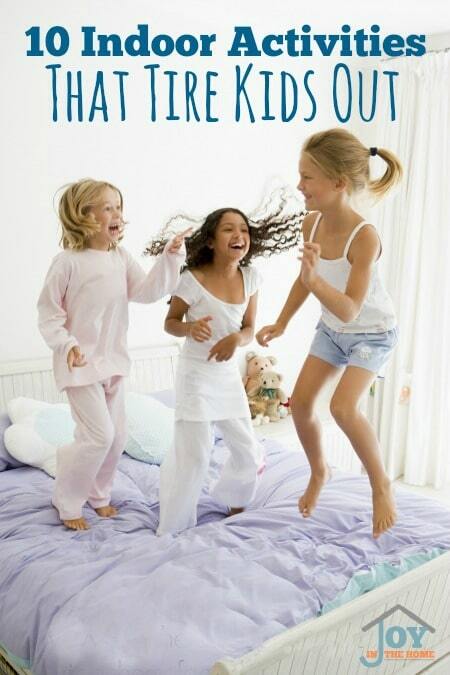 Pillow Fights – There is NOTHING that can get your children into moving than a good old pillow fight. Be sure to set rule before starting to ensure no one hits down on the head of someone else, or that can cause some injuries. Aim for the belly and having fun! Wrestling – Clear out a good area of your living room or the children's bedroom and let them wrestle! It is fun and hilarious to watch as well. What is a hoot is when you challenge your early teen boy and can still pin him down without a problem. Yes, I have to let them know I'm still MOM. If not of this helps your active children, you may want to just pull the CHORE card and get them moving to get the house clean, because we all know that tires us out!